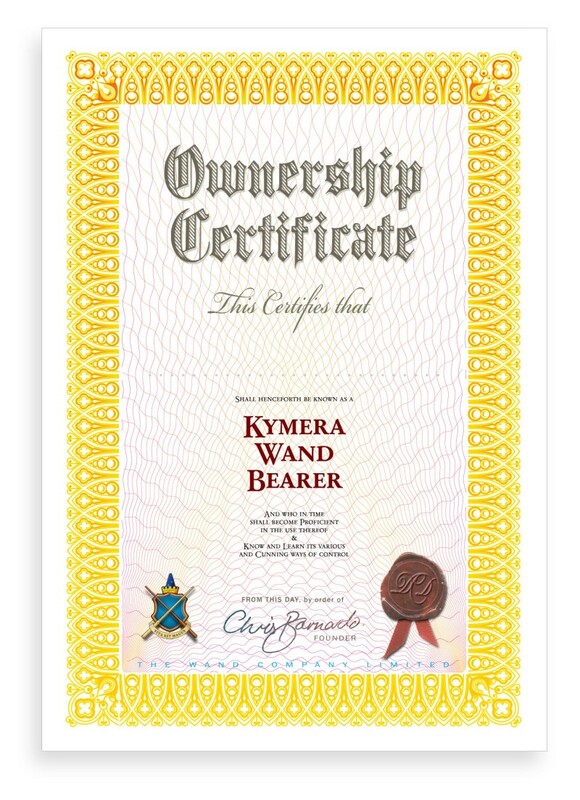 The pleasure of Kymera Wand ownership can only be increased by the use of this authentic Wand Bearer’s Certificate. To use, click on the image to download the PDF and view using Adobe Reader. When you’ve downloaded the certificate, click just above the dotted line and simply type the name of the wand bearer in our luxuriously regal script. For the best effect, ink jet print the certificate on a lightweight card and run a gold or silver felt-tipped marker around the edge of the sheet. Mount appropriately to protect and maintain your Wand Bearer’s Certificate in mint condition. To display the correct script typeface for your name, this file should ideally be viewed using Adobe PDF Reader. Adobe Reader is standard on many computers, but if you do not have it, you can get the most up to date version free from Adobe, here.